I was a little skeptical about a book called “The Interpreter’s Tale”. I was extremely skeptical about the dedication to “linguistic nerds” on the first pages—not because I wasn’t sure that I would like it, but because I wasn’t sure that anybody else would. Well. I shouldn’t have been worried. This is a charming, breezily-written story about an interpreter named Eliadmaru, a bookish, curious young man who has made a habit of studying obscure languages. He is picked up from his obscure post at a border station by a relative of the Emperor, called “the Autransi”, for a diplomatic mission to a neighboring country. His job, ostensibly, is merely to facilitate the Autransi’s attempt to heal the neighboring king’s sickly daughter with magic, and then help the Autransi woo the princess and secure a favorable trade agreement. Their mission becomes more complicated than it looks, as you might expect. There are enemies in the foreign court and members of their own mission who have ulterior motives. Eliadmaru develops a relationship with the imperial sorceress, a woman named Folso, and he finds himself with divided loyalties as his duties as a translator, his oaths to the Autransi, and his fondness for Folso all come into conflict. I don’t want to reveal anything about the last bits of the plot. However, the light-hearted nature of the story takes a sudden turn towards the end, and the store ends with a psychological and moral quandary of surprising depth. Characters I thought that I understood turned out to have more complexity than previously suspected, and the protagonist is forced into hard choices with no good options. And I am ambivalent about the ending, which has had me wondering for several days whether Eliadmaru actually did the right thing. And as for the promise of the title and dedication: there are plenty of allusions to linguistic trivia and the mental and physical act of interpreting, but these discussions don’t overwhelm the story, and there’s plenty to recommend the book even to someone who isn’t terribly interested in linguistics. I’d recommend the book to anyone who enjoys a good political fantasy. As of a few days ago, Storm Bride is no longer for sale. I’m not sure what that link is there for. It’s a 404 page where once there was a book. You can click on it if you want, if only to convince yourself that nothing is there for you to buy. My publisher, upon hearing that I had moved to Romania, decided that they had to terminate my publishing contract, because they only work with U.S. authors. This was not an outcome that I considered likely when I moved here; but here I am, and here my book is not. I am getting the file with the typeset book from the publisher. I’m getting a new cover. And I’m going to re-release the book in December 2015. So it’ll be back, and it’ll have some new features which I can do easily now that I’m publishing it myself, such as a map and a glossary. Meanwhile, if you’re interested in getting updates on when the book becomes available, you can sign up for my newsletter. It looks like I got to Romania just in time. In Bucovina where I live, there is a cathedral which has been under construction for roughly ten years, and this Sunday, my second Sunday back in the country, was its official dedication and opening service. My favorite moment is this one, in which the bells began to ring at the entrance of the bishops into the church for its dedication. Church bells represent the voice of God, and let me tell you, standing underneath that enormous bell tower and hearing their enormous clatter, that’s certainly what it sounded like. I have pictures, taken on my small and rather inadequate phone. But I got early enough to get close to the front, so I had a good view. After going to the opening of the cathedral, my family and I headed back home where we had a lunch of sarmale (cabbage rolls stuffed with rice and meat) before heading out into the forest preserve near where we live. We swatted around a birdie with badminton rackets and went on a walk through the woods, collecting wild apples, walnuts, and acorns along the way. And that evening we went to an open-air market with local products, where we ate mici, a Romanian specialty sausage made from a mixture of beef and pork, and bought two kinds of cheese: cașcaval afumat, a sort of smoked cheddar, and brânză burduf. And now we’re home, and exhausted, and happy, the perfect end to a lovely Sunday. In three days, I’m moving to Romania. This is probably the most exciting thing I’ve done since the time I went to Romania to live there for a year, when I met my wife. But this time I’m not going for a year—I’m going to stay, and my wife and kids are already there. They headed off to Romania about a month ago, while I stayed to finish up some final projects at my work and at home. Those things are done now. Tomorrow is my last day of work. The day after that I tie up loose ends, and then I fly out. But I hear you ask: Why are you moving from a comfortable and well-paid job in the US to Eastern Europe, of all places? Don’t they have bears and Communists there? Of course they have bears and communists! In fact, there are over 6,000 bears in Romania, about a third of all of the bears in Europe, making Romania a major destination for European hunters and sportsmen. As for Communists, well, my wife calls herself a Communist to anyone who will listen, but what she means by that is probably not what you’re thinking. That’s a topic for another post. My wife has three sisters who live in Romania, along with her parents and something like sixty cousins. The trajectory of my life over the past decade has towards a greater engagement with family and long-lasting communities, and away from urban areas and high-stress jobs. In 2011 we moved from Seattle to Minnesota so we could spend more time with my family, and as a result of this change we were able to develop deeper relationships with my cousins, grandparents, brother, and parents that we would never have had the opportunity for otherwise. Moving to Romania continues this trend: we’ll be minutes away from Larisa’s sisters, and my children will get a chance to know many Romanian cousins whom they had never previously met. My wife’s family has deep roots in the area where we’ll be living. She was willing to uproot herself and come to the US with me for a decade. Now it’s my turn to go to her hometown, and I can’t wait. I kind of got sick of sitting at a desk all day with a manager looking over my shoulder, you know? Don’t get me wrong: I really liked my software job, but as part of my shift in priorities, I found myself progressively more disengaged from the work I was getting paid to do, and more interested in other things. Selling my house in the US and moving to Romania (a country with a lower overall cost of living) allows me to go into freelance programming, something which offers me tremendously more flexibility and freedom. I hope to cut back on the number of hourse I spend programming, and put that time into other things. One of which is publishing. I’ve been writing like a madman for the past several months, and I’m hoping to use some of this extra time turn my writing output from “substantial” to “OMG SO MANY WORDS”. I have a half-written series of six books which I’m going to start releasing next summer, and beyond that there are many, many worlds that I want to visit. I have a crazy dream of putting out a novel every other month, and with all this newfound time, I might just be able to do it. My wife, meanwhile, is working hard to bootstrap her aromatherapy and therapeutic massage business in Romania. This is something she had worked on here in the states for the past few years, and there’s a large untapped market for this kind of thing in Romania. I think she’s gonna make it big. The main thing that my wife and I want to do, the thing which really got us thinking about Romania in the first place, is make a positive difference in people’s lives. 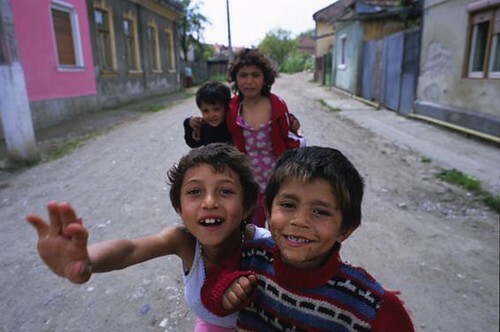 Gypsy children in Aiud, Romania. Larisa’s sister and brother-in-law spent the last several years working in a small Gypsy village in Romania providing social services and education to the impoverished population there. They initially contacted us about two years ago wanting to know if we would be interested in joining them. We thought about it seriously, but for various reasons that arrangement didn’t work out for us. But we couldn’t shake the idea of revamping our lives, and using some of our money and expertise to reach out to people in Larisa’s home country. The idea we decided we could act on was to open a kind of after-school program for children from poor families who are struggling in school. The Romanian education system is set up to require a lot of parental supervision: the school day is only 4 hours long, and children are provided with homework and lessons which they are expected to complete with the help of their parents. However, economic changes in Romania mean that there are lots of families with absent parents or parents who aren’t able to support their children’s education due to their own poor education or personal problems. Romania is relatively lacking in the kinds of extracurricular activities and remedial education which can help these kids. We hope to step in to fill this gap in our local city. We’re focusing on children in grades 1-6, hoping to intervene before people fall too far behind. Initially, we’ll simply be going to local principals and offering tutoring in common subjects (English, math, reading, and writing). Soon we hope to expand this into an after-school program which offers a healthy meal followed by a structured time for homework and mentoring. Eventually, we hope to integrate the after-school program a fuller family-oriented curriculum that offers counseling and support to parents and their kids together. But that’s still a ways away! We’ve determined to go slow and take things as they come, discovering exactly what the needs and priorities of the people we work with are. We’ve already had to change plans a few times, and we might have to change them again. But we’re definitely going to do something. It’s going to be an adventure. I’m incredibly excited. I read this book because, you know, it was free on Amazon, and it seemed like a good entry into Arenson’s oeuvre. This was, I believe, the first book that Arenson wrote and published… and unfortunately it shows. Let’s recognize the good stuff: the setting is interesting and unique. The world is divided into two halves, a day half and a night half, following a poorly-understood catastrophe in the distant past which caused the world to stop turning. The night half of the world is expecially intriguing, as Arenson has built a fascinating culture and ecology based on a place that never sees sunlight, and he manages to convey most of how the night side works without resorting to infodump. There are some really beautifully described scenes, mostly on the night side of the world, and some excellent battles towards the end. Furthermore, there are some very clever subversions and reversals of expectation in the presentation of the two halves. Initially we’re given to understand the inhabitants of the night as monsters, creatures who live in eternal darkness, but after a few chapters we move into the POV of one of the night-dwellers. From her perspective, the day-dwellers are demons of fire, creatures who inhabit the realm of blistering light and who emerge from the heat to kill for inscrutable reasons. But there are numerous problems with the story. We start out in bog-standard Fantasyland, with characters who are pretty stock. We have the Clueless Farmboy who must become a warrior, the Tomgirl (complete with an foreshadowed romance with the Farmboy), a pair of Sidekicks distinguished solely by the fact that one is fat and the other is skinny, a Noble King, and an Evil Priest. All of the creativity seems to have gone into the night half of the world, but since half the story takes place in the day, that means that half of the book is dull and cliche. The night half of the plot has its own problems: the protagonist of that half of the story leaves early on on a quest, but she’s then presented with a series of irrelevant obstacles which mostly serve to assure that she’s still in the place required by the plot when the end of the book comes. And there is a second subplot which takes place in the dark (which I won’t give details about because of spoilers), which shows up very late, never impacts the main story, and then abruptly closes with no resolution. I can only assume that that plot thread exists to set up elements of the sequel, but it doesn’t pull its weight in this book. Overall, I would not recommend this book very highly, except as an introduction to the world. The good news, though, is that I’m reading some other books by Arenson, and they get better. Much better. “Designed by committee” is considered an insult for a reason. Things which are designed with decision-making input from multiple people usually turn out terrible, because there is no unifying vision which can create something beautiful from the conflicting ideas of the committee members. But the popular alternative, of the lone genius, is not much better. The lone genius doesn’t have input from anybody outside his head, and so he often winds up with something which is appealing to his idiosyncrasies, but not to anyone else. The winning model seems to be “individual ownership with collective feedback.” An individual owns the project and has final decision-making power; there is no collective veto or decision stress which comes from needing to pacify multiple conflicting parties. But that individual’s decisions are constrained and informed by feedback from peers and managers, who can help the individual step out of their personal vision and accomplish something which is intelligible and appealing to a broader audience. I have seen this work in both software and writing. I would not be surprised to hear that this basic model works for all endeavors that require any kind of creativity. A little while ago I posted on headcasting for Storm Bride based on pictures that I found on the internet. I promised a post about the locations of Storm Bride, which is late, but better late than never. 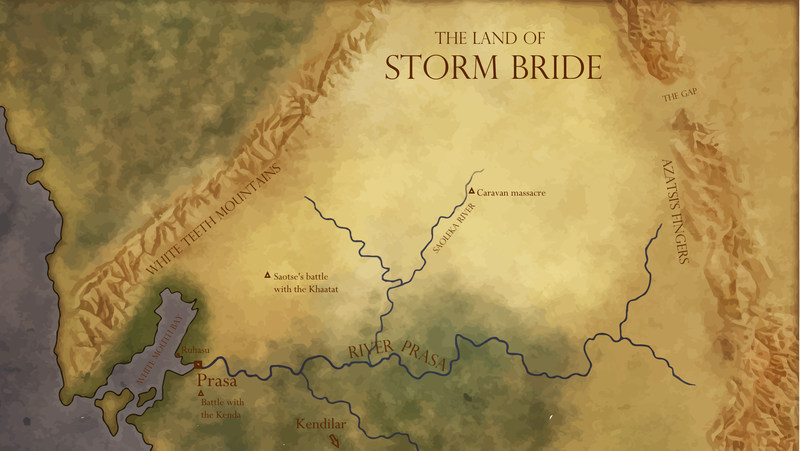 The Land of Storm Bride (Click for bigger image). This one would be called Zero Pine Rock. The greater size of Prasa relative to any real-world settlement is one of the big changes. 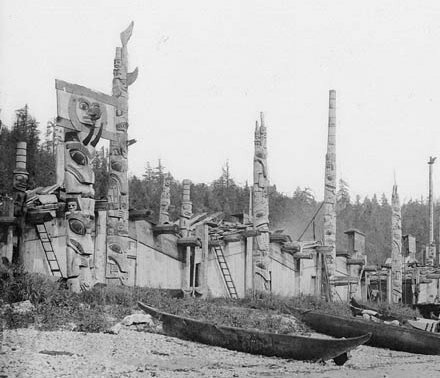 Unlike the other tribes of the Pacific NW, the Prasei are not just fishers and foragers, but have a variety of domesticated crops which drives a larger population size. This is exactly what I thought the Bans should look like, and I was excited to see that something very similar to what I had imagined actually existed. Finally, much of the action of Storm Bride takes place away from the rainy coast, on the high, dry plains which are in the rain shadow of the White Teeth Mountains. Just as I imagined the coast of the Pacific NW as the setting for Prasa, I took the inland parts of Washington state, across the Cascade Mountains, as examples of what this area looks like. Imagine the tents and cattle of the Yakhat spread across those hills, and it’s just about perfect.